^ 4.0 4.1 Salesman, Richard M. "The Cause and Consequences of the Great Depression, Part 1: What Made the Roaring '20s Roar" in The Intellectual Activist, ISSN 0730-2355, June, 2004, p. 16. Emphasis original. ^ Edward Teach - CFO Magazine. The Bright Side of Bubbles - CFO.com. Cfo.com. May 1, 2007 [2008-10-01]. （原始内容存档于2008年9月22日）. ^ Timeline: A selected Wall Street chronology. PBS. [2008-09-30]. （原始内容存档于2008-09-23）. ^ NYSE, New York Stock Exchange > About Us > History > Timeline > Timeline. Nyse.com. [2008-10-01]. （原始内容存档于2008-11-06）. ^ 14.0 14.1 Linton Weeks. History's Advice During A Panic? Don't Panic : NPR. Npr.org. [2008-10-01]. （原始内容存档于2008-09-19）. 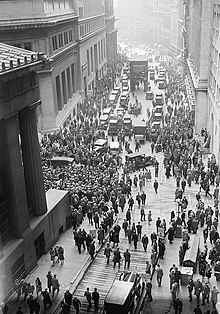 ^ American Experience | The Crash of 1929 | Timeline | PBS. Pbs.org. [2008-10-01]. （原始内容存档于2008-09-23）. ^ Historical Index Data – Market Data Center. Wall Street Journal. [2008-10-14]. （原始内容存档于2008-10-10）. ^ Facing the facts: an economic diagnosis. [2008-09-30]. ^ Shiller, Robert. Irrational Exuberance, Second Edition. Princeton University Press. 2005-03-17 [2007-02-03]. （原始内容存档于2007-01-01）. ^ Scardino, Albert. 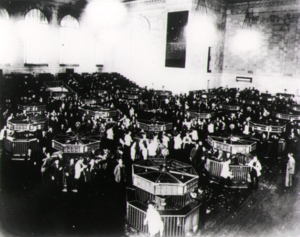 The Market Turmoil: Past lessons, present advice; Did '29 Crash Spark The Depression?. New York Times. 1987-10-21. ^ Practice has plenty of historical precedents - Financial Times 互联网档案馆的存檔，存档日期2008-12-11. “Part 1: What Made the Roaring'20s Roar”, June, 2004, pp. 16–24.